Are you having a hard time staying hydrated while you’re pregnant? Do you even know what dehydration signs are? Getting dehydrated is always a bad idea. But at a time when we’re growing a little human inside ourselves, it becomes extra important to make sure we have enough fluids. It can be so difficult to keep on top of everything during pregnancy, and hydration is no exception. This handy guide might help you spot the signs of dehydration and give you peace of mind when you already have enough to be stressed about. How Do I Know When I Am Dehydrated? How Much Water Should You Drink A Day While Pregnant? What Causes Dehydration During Pregnancy? Can Pre-Existing Health Problems Make Dehydration Worse? Dehydration is when your body is using more water than you are drinking. Many of us assume that feeling thirsty is a sign we are about to get dehydrated, but actually, thirst is a late dehydration symptom. We are already very dehydrated by the time we feel thirsty. When you are dehydrated, you will also experience a dry mouth, lips, and eyes, because of the lack of fluid to keep them moist. Dark urine and an increased risk of UTIs because your body is restricting how much water leaves. And finally, because our brains need to be hydrated to work, you might experience poor focus, tiredness, and dizziness. If you are feeling any of these symptoms, it may be because you already lack water and you desperately need to drink some. Because every bodily process uses some water, we normally need around two liters a day. It’s a myth all of this needs to come from clean, fresh water. These two liters, or four pints, come from all food and all drinks. So if you eat a mango, you will get some water. If you drink a coffee, you will get some water. Some people drink almost all their water as clear tap water, whereas others barely drink water at all, and almost everyone manages to stay hydrated most of the time (source). All our bodily processes use water, and pregnancy is no exception. There are many ways that pregnancy increases the amount of water we use. Your blood volume increases by one and a half times during pregnancy. In some women, it can even double. Normally we carry 2600 milliliters of blood in our bodies. A healthy pregnant woman can carry anywhere from 3850-5000 ml of blood (source). If we do not drink enough water, we could suffer low blood pressure. The placenta and amniotic fluid use up a lot of water. Again, if you do not drink enough water, this can stop the placenta and amniotic fluid from growing properly, which could lead to problems later in the pregnancy. Too little water can stop things from growing properly by causing a buildup of byproducts. When we are growing a placenta, extra skin, and yes, a baby, we are using a lot of proteins and minerals. These proteins and minerals leave little parts of themselves that need to be flushed out in our urine. Less water means less urine and fewer chances to get rid of these toxins. Many vitamins are known as water-soluble vitamins. B vitamins and vitamin C most importantly, are only carried in water. Without enough water in your diet you might not absorb enough of these vitamins, causing problems for your baby. If we do not drink enough water, we may not have enough fluid to support breast milk production. This is especially important if you have a baby or toddler you are still breastfeeding while you are pregnant with the next baby (source). Much like with the recommended two liters a day, the recommended amount during pregnancy is not an exact science. A general amount to aim for is six to eight 8-ounce glasses of fluids a day on top of your foods. That counts water, milk, juice, soup, and every other kind of liquid. But unlike the standard recommendations, these six to eight glasses do not count the water found in solids like fruit, or the water found in caffeinated drinks like tea, coffee, or cola. And if you are active or live in a warm climate, remember the amount you need will probably go up by a cup or two. During the second and third trimester you might find yourself getting much thirstier again, so remember to adjust based on your needs. If you are drinking 12 glasses of fluids on top of foods to stop yourself feeling thirsty, then that is what you need. Just remember the more glasses you drink, the less you want to choose a drink with calories. Try to stick with no more than two to three glasses of juice, soda, and full-fat milk every day. All the rest should be water or sparkling water if you want some fizz (source). So why are we feeling so thirsty when we are pregnant? In part, it is down to the issues we talked about earlier — we are just using a lot more fluids than normal. This might not be too obvious in the first trimester because the baby is still very small, our blood volume has not changed much, and the growth of our baby and bump is still slow. But by the end of pregnancy, you will be amazed by how much extra water you are carrying and using. Our dietary habits. If we are feeling nauseous, we might skip meals, or spend a whole day eating nothing but dry crackers. Do that too often, and you will miss out on all the fluids which you were getting from your food, and end up dehydrated. Being sick. Morning sickness can make us dehydrated because we can suffer vomiting and diarrhea, both of which make our bodies lose more fluids than usual. The more you vomit, the more you need to drink. Water retention. Between the extra blood and feeling a bit sluggish, the end of pregnancy can be accompanied by a lot of swelling. Swelling in the legs especially can take a lot of water away from the rest of the body, causing dehydration. But if you exercise to get rid of the water retention? Then you will sweat a lot, which can dehydrate you too (source). Dehydration can happen to anyone, but some people are at higher risk of dehydration, and these factors affect pregnant women as well. Diabetes can make you more likely to get dehydrated, no matter whether it is type 1, type 2, or gestational diabetes. Although we are recommended to exercise, sweat means losing up to half a cup of water per hour of activity, so we need to adjust. And getting overheated because we are wrapped up too warmly, or spend too long in a hot shower, can also make us sweat too much. Try and avoid these situations if you can, but if you can’t, make sure to drink one or two extra glasses of water every day. The symptoms of dehydration in pregnancy are not too different from the symptoms of dehydration at any other point in our lives. But whereas it is not harmful to be a bit dehydrated when we are not pregnant, when we are carrying a baby, we need to be much more careful about the early warning signs of dehydration. Some of the earliest signs of dehydration are sleepiness, moodiness, and headache. You might not feel thirsty, dry, or dizzy, but if your energy and mood have crashed and your head is hurting, chances are you are starting to run low on fluids. A sign of dehydration that is very obvious when we are pregnant is a reduced need to urinate. Because one of the first signs of pregnancy is needing to pee more, and as the baby gets bigger the pressure on your bladder makes you go more often, less pee is never a good sign. Because our body temperature becomes harder to regulate during pregnancy, we might find ourselves overheating more often than usual. This is a very reliable sign we are not getting enough water. Your body uses water to cool you by sweating lightly and controlling blood flow, so not enough water means feeling very hot suddenly. Another sign of dehydration is having contractions. If you’re having contractions, especially in hot summer months, try drinking a glass of water. If you’re dehydrated, that should make them go away. Having a rapid heartbeat when standing up can be a sign of dehydration. Even before the blood pressure drops when standing up in dehydration, you might notice your pulse increasing upon standing, which is a sign you are probably dehydrated. The most important thing to do about dehydration during pregnancy is to be aware of the risks and avoid it. If you have nausea, try warm water or mild teas, which might be less of a shock to your stomach than cold water. Avoid overeating protein, too much sugar, and too much salt, as this can make you urinate more. But don’t cut out all salts. You need some salt to hold onto the water you are consuming. If drinking is still tough, try marking a bottle of water and sipping every 15-20 minutes, as if you were exercising. This can keep your fluid levels up even if you are exhausted, nauseous, and finding it very difficult to drink enough. Do not eat overly dry foods when you can avoid it. If your nausea calms down, make a point of having soups and fruit salads, which are rich in water and minerals that will keep you hydrated. If you are having trouble staying hydrated, wear clothes that are cool and breathable, and avoid exercising so you do not lose any more water than necessary by sweating. It is also perfectly safe to take rehydration salts during pregnancy. The dose found in most oral rehydration salts (ORS) is not high enough to cause any problems, and if you are suffering serious vomiting or diarrhea, you may need them (source). Reduce caffeine intake. Caffeine is a mild diuretic so that, if you drink a lot of caffeinated beverages, you might end up losing fluid in the end through your kidneys. 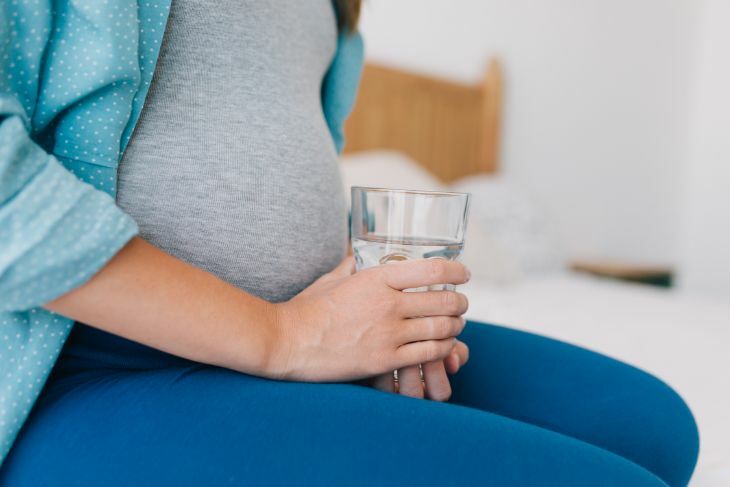 Even though moodiness and a low mood are normal during pregnancy, when you’re dehydrated, if you find you are irritable or angry, this might be an early sign you are headed for severe dehydration. Not urinating/passing dark or brown urine. These could all be signs you are severely dehydrated. In these cases, we do not just need to drink water, we need medical help, both to re-hydrate and to find the source of the dehydration (source). If you get severely dehydrated, you will go to the hospital, where doctors will work to re-hydrate you as quickly as possible. The best way of doing this is with intravenous (IV) fluids. This is where fluids are given directly into the vein with a drip. It does not rely on digestion, meaning you cannot vomit the fluids, or fail to absorb them because of having too few minerals. It is the fastest way of getting water back into your body. Medication and nutrients can be added to the water if they are needed. There is a slight risk of infection and blood loss when the IV is inserted, but other than that the use of IV fluids is much safer than any other way of handling dehydration (source). Dehydration during pregnancy is a serious issue. It is a risk to your health, your baby’s health, and both your lives. The most important thing is to try and stay naturally hydrated throughout your pregnancy. If you are finding it hard to keep water down, or you see signs of dehydration, go to your doctor to see what can be done. If you see signs of severe dehydration go straight to the emergency room. It’s better to be overly cautious than to suffer complications. Have you suffered from dehydration during pregnancy? What helped you power through it? If you know any moms who are struggling with this issue, please share this article with them. We’re here to help! Dr. Christine Traxler MD, is a family practitioner with a special interest in obstetrics and gynecology. Dr. Traxler graduated from the University of Minnesota Medical School in 1986 and also holds a Bachelors of Science in Biochemistry. What are the Best Prenatal Vitamins? Are My Prenatal Vitamins Causing Me to Gain Weight? Why Do My Breasts Hurt During Pregnancy? Mom Loves Best is a participant in the Amazon Services LLC Associates Program, an affiliate advertising program designed to provide a means for sites to earn advertising fees by advertising and linking to Amazon.com. All information found on MomLovesBest.com is intended for informational and educational purposes only. The information provided on this website is not intended to be a replacement or substitute for professional medical advice.